I'm working on a custom jewellery order for a die-hard Adelaide Crows fan at the moment. She's really likes my Katiedids Plumescent bracelet but as well as the lovely plummy shades of the original bracelet, she'd also like it in the Crows colours of blue, red and yellow. Solid primary colours make such a bold statement and I was a little worried about how that would translate into a blingy bracelet so I decided to make up a couple of variations and ask you to vote. The first one uses just the three primary colours - red, yellow and blue plus some very blingy silver balls. I softened the look of the second one by adding two scallops of orangey-red crystals and the blue Swarovski crystals are replaced by navy bicone crystals. So, what do you think?........ Which version do you think she'll pick?....... Remember, this is for a passionate Adelaide Crows fan! Leave your comment below and you'll be in the running for the one she doesn't choose. I'll draw a random winner on Saturday night, 17th September. Don't forget to leave me your contact details so that I can contact you if you're the lucky winner. And as for the football season? Well, sadly it's over for the Crows as well as my beloved Brisbane Lions. Both teams are cellar dwellers this year so neither team is taking part in the finals but that doesn't mean we can't still show our support for our favourite team in the off season by wearing a little piece of bling in our team colours! 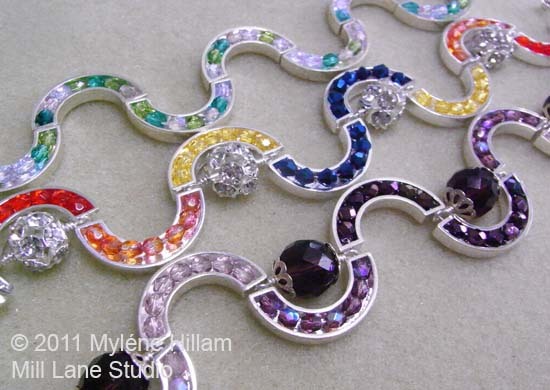 As always Mylene, your jewellery is gorgeous! I am not joining in your give-away (as I won last time!) but I agree with Julie P - the second one has a more subtle look but they are both beautiful!! Hi Mylene. I love both but would prefer the second one. Thanks for the chance to win either. these are both beautiful - i would go with the second one. A true fan will go with the colours of the team, so I think she would pick the first one. I prefer the second one, but she may even choose to take both...one for each wrist. If you are a big fan you want to show it. I think the first one makes the statement.